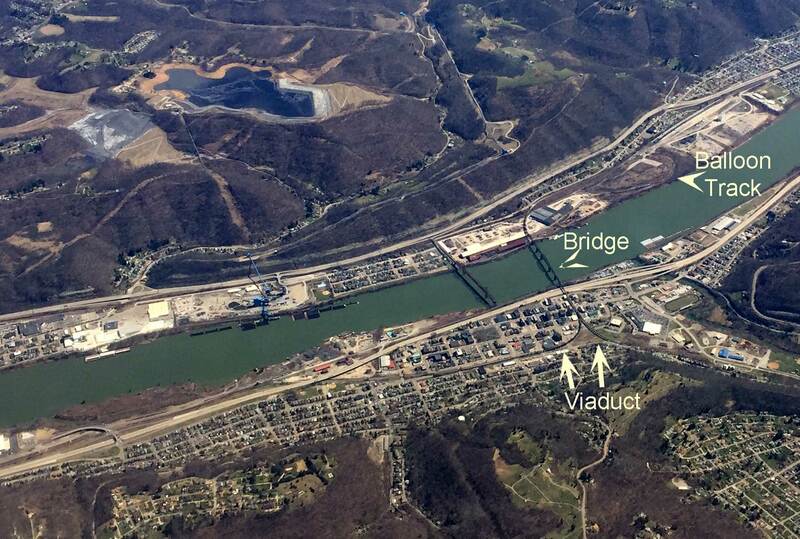 Bellaire, Ohio, is on the near side of the river and Benwood and Benwood Junction, W. Va., is on the far side. The B&O had a yard and engine facilities at Benwood Junction. Here’s a USGS topographic map to download. This 1935 Wheeling topo map includes Benwood and Bellaire in the lower left corner. The line accessing the Wheeling passenger and freight terminals followed the river to the north, left on the photo. The B&O line to the south went to Moundsville where the original mainline turned east to Fairmont and Grafton, W. Va. The Ohio River line continued south from Moundsville, following the river to New Martinsville, St. Mary’s, Parkersburg, Huntington, and Kenova, W. Va. Traffic from these lines bound for Columbus or Cleveland went across the bridge at Bellaire. On the west side, the line split with rails headed towards those two Ohio cities. A unique feature in Benwood Junction was a balloon track that enabled trains from Wheeling to access the bridge for the Ohio lines. The image above is a tighter crop with call outs added to highlight the B&O track. A historic stone viaduct in Bellaire leads to the bridge and was featured in the movie Unstoppable. Moments after taking this photo with my iPhone, the plane flew directly over the location of the B&O Wheeling Freight Terminal. 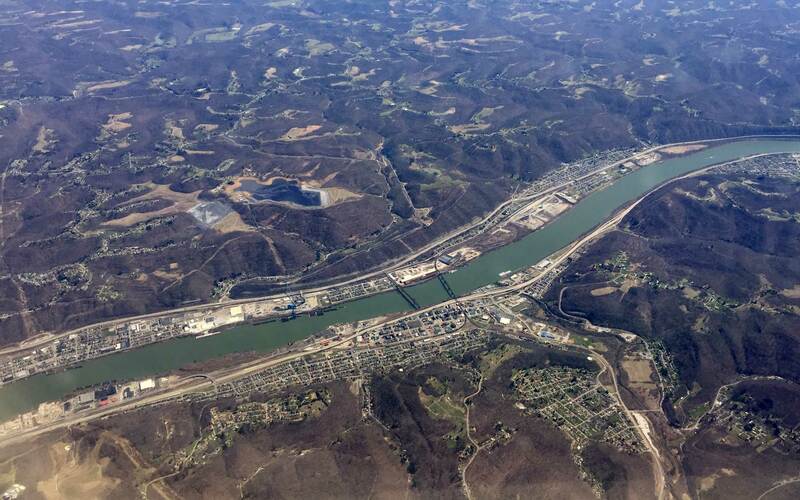 I barely caught a glimpse of the spot where Wheeling Creek flows into the Ohio River as the flight approached the Greater Pittsburgh International Airport. I had seen this before on another flight but did not have the camera ready. This time I was ready but there was no angle for a decent image. And so it goes. Keep your camera or iPhone handy when you fly so you can catch a birds-eye view of a rail location. Who knows, you could snap an image of your favorite prototype location on an upcoming trip. You left out the most important part – the interchange with the 3′ gauge Ohio River & Western at Bellaire! Tracing RR ROW from commercial airlines is a great way to pass the time. No need for your own camera as the USGS’s National Map website will provide you with a lot of high resolution aerial photographs, 1 pixel per foot resolution in some cases.